Hi friends! I'm here today to share with you a friends (in real life) home that I adore. Welcome to the home of Sair Foltz Jordan! She is a Conservation Biologist for the Xerxes Society and lives in Minnesota as well. Not only do our children love each other, I totally enjoy spending time with her too! She lives a few miles away on 27 acres of paradise also known as Keepsake Farm. Sair and her husband Nick grow and sell various things at our local farmer's market during the summer months. One thing that is a bit intriguing about these two is their knowledge of edible fungi! (+ so much more!) Last year the local newspaper did a little write up on them and they also maintain edible fungi website. I'm excited to share with you a glimpse into their space! I'll let Sair tell you more about their home below. I live with my husband and 3 year old son in a little wooden house in the country—surrounded mostly by red pine forest, fruit trees, a vineyard, meadow, and vegetable gardens. 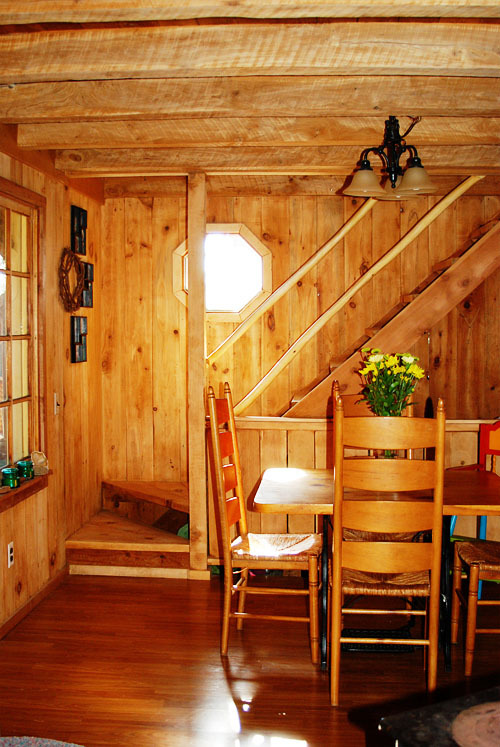 Looking around inside the house, there’s wood everywhere—walls, floors, ceilings. I love that! My dad designed and built this home (as a rental property in the ‘80’s), so that, of course, is really special to me. 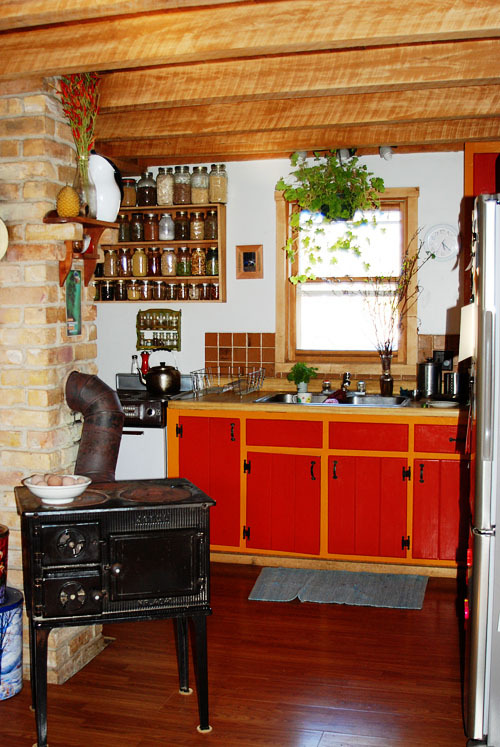 We really enjoy the open floor plan, and the little wood cook-stove in the center ties everything together, both practically and aesthetically, I think. In the winter we make almost all our meals on it, and sometimes even bake in the little oven. In the fall and spring it is great for heating water for coffee and warming up the house in the morning before the sun comes out. We don’t fire it in the summer, but it becomes a surface for vases of flowers, baskets of tomatoes, and the like. 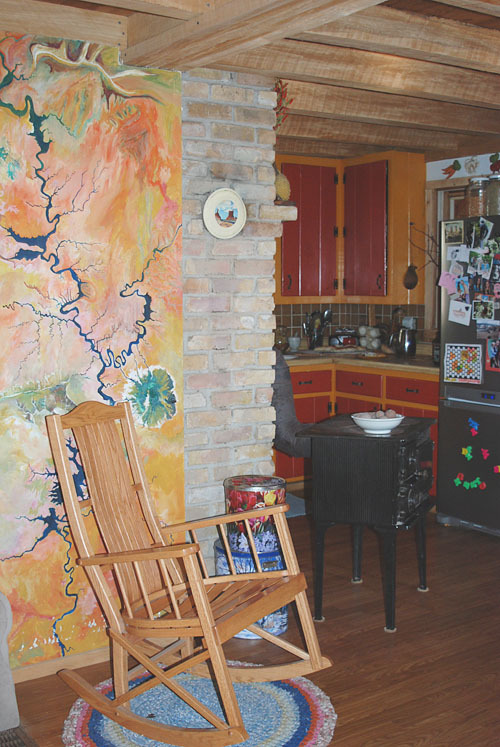 The wall above is a topography painting of Glen Canyon. Decorating with elements from nature is something I’ve been doing for as long as I can remember. Recently, it’s been fun to see that my little boy does this too. When we’re outside we simply pick things up that we like and carry them around. If something makes it back to the house, it usually comes inside. Then-- there it is. Beautiful and somehow very significant; a reminder of a place, a moment, a different creature or life-form. I also think it might be a way of coping with the indoors—bringing some of the outside in! And sometimes REALLY SURPRISING THINGS happen when you bring nature indoors! When I was in college I brought in a stick with a strange, geometric growth on it and put in on the window ledge above the couch…. I guess I thought it was a fungus. Months later, a train of tiny caterpillars was spotted making its way across the house—leading back, of course, to the stick on the window ledge. Turns out the growth I was attracted to was a mass of moth eggs. I think this was around the time my roommates made some “house rules”, and I decided I wanted to be an entomologist! More recently, I gathered some bright red dogwood branches that stood out in the snowy landscape. I put them in a vase with water in the kitchen, and a few weeks later (just about when I was ready to swap them out for something else) bright green leaves and really tiny clusters of white flowers emerged! This turned out to be the coldest/snowiest Minnesota “Spring” on record (I’m pretty sure), so those dogwood flowers in our kitchen are still the only blossoms to be seen around here. That is, until Rachel & her son appeared on the doorstep today with a big bright bouquet! Thanks to Rachel for inviting me to participate in her blog and home tour, and for another lovely afternoon well spent! It was fun to personally photograph Sair & Nick's home! They have such a magical little place in the woods! Thanks again guys! 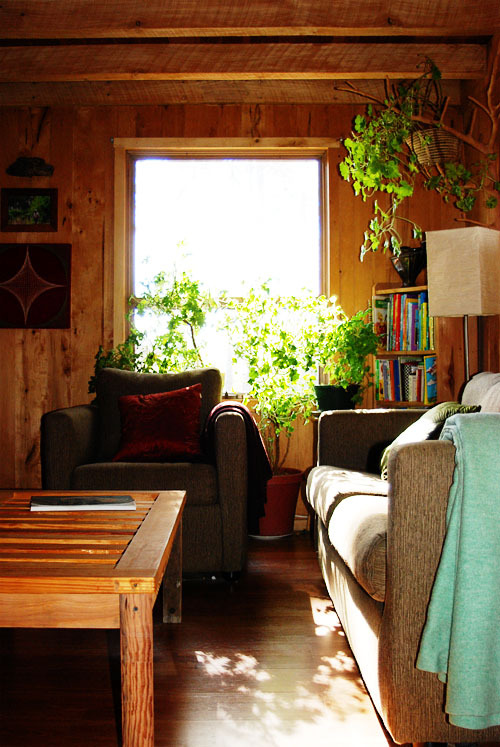 wow, look at the light in that home. It's so gorgeous, like something from a dream. 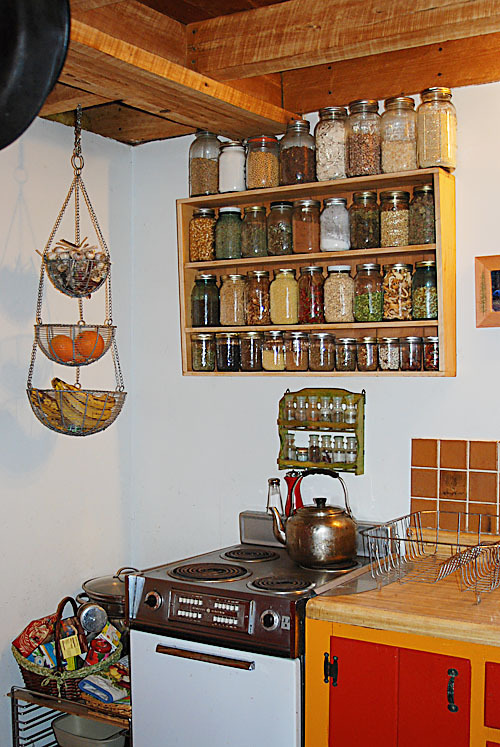 i love the shelf of jars! so practical and gorgeous! 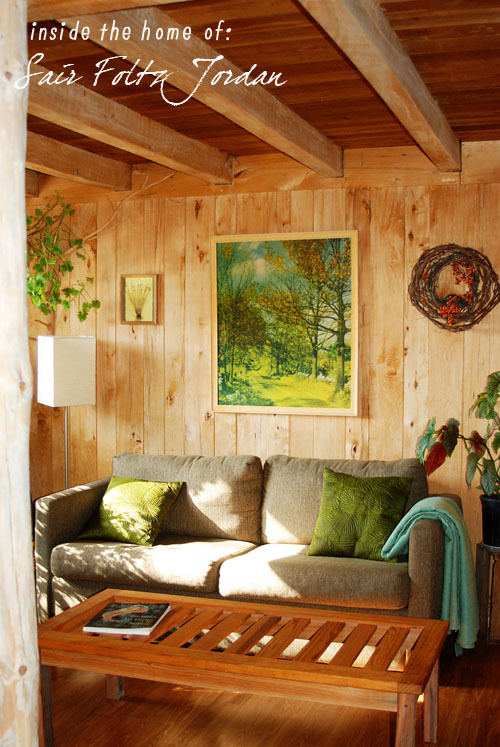 Love all wood walls and the rustic feel! It's so cozy and warm!